Eotyrannus was a carnivore (meat-eater) that lived during the Cretaceous period, about 125 to 120 million years ago. Its fossils have been found in the Isle of Wight in Southern England. Eotyrannus was an early relative of Tyrannosaurus rex. It was much smaller than Tyrannosaurus rex - Eotyrannus was "only" about 20 feet (6 meters) long. 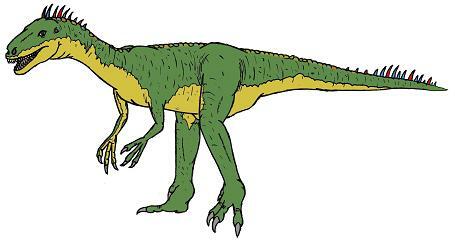 Additional differences between Eotyrannus and Tyrannosaurus rex, include the fact that Eotyrannus was very lightly built, and had long grasping hands (whereas Tyrannosaurus rex had relatively puny arms). Eotyrannus probably preyed upon Hypsilophodon and Iguanodon, which both contemporaries of Eotyrannus, and lived in some of the same areas. European Dinosaurs - Eotyrannus lived in Britain. Eotyrannus was a genus of dinosaur. "Eotyrannus" means "dawn tyrant". 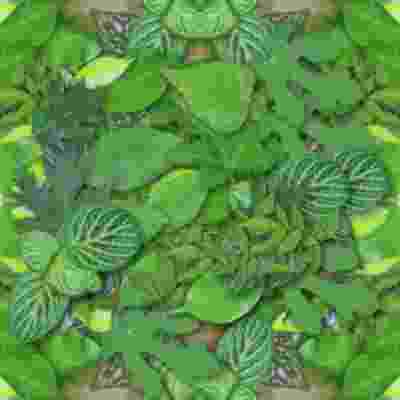 The name refers to the fact that it was an early relative of Tyrannosaurus rex. Eotyrannus was a member of the Saurischia ("lizard-hipped") order of dinosaurs. What this means, is that although Eotyrannus was not closely related to lizards, it did have similarly shaped pelvic bones. 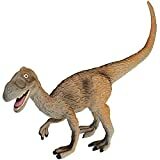 Eotyrannus was a Theropod - a member of a group of related bipedal dinosaurs that included the ancestors of birds (although Eotyrannus was not itself an ancestor of birds). Eotyrannus lived between about 125 million years ago and 120 million years ago, during the Cretaceous period. Eotyrannus was a carnivore (meat-eater). Eotyrannus was about 20 feet (6 meters) long. Eotyrannus weighed about 300 to 500 pounds (136 to 227 kilograms). FUN FACTS: Eotyrannus means "Dawn Tyrant". Eotyrannus was on the earlies Tyrannosaurids known. It had a heavy skull and a powerful bite. PRODUCT SPECS: 5.71 in L x 1.57 in W x 3.54 in H, suitable for children 3 and up. CollectA's replica of the Eotyrannus is lifelike down to the details on its skin and the wrinkles in its birdlike feet. The dinosaur's name means ''dawn tyrant'' an dit lived in the Early Cretaceous period on the Isle of Wight in the U.K. The incomplete fossilized remains were found in teh late 1990s and the dinosaur was named in 2000. This beautifully sculpted, collectible figure from our Prehistoric Life Collection measures 5.7''L x 3.5''H. Each figure in our Prehistoric Life Collection has been approved by archeologist Anthony Beeson, a well-respected expert in paleoimagery. All CollectA models are individually hand crafted to the highest standards and made with the finest and safest phthalate-free, lead-free materials. Create a natural world in miniature with high quality toy replicas from CollectA. Our mission is to educate collectors and to provide the greatest opportunity for creative play. 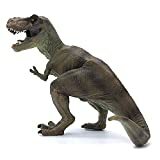 Dinosaur features nice detailing making it perfect for educational displays or in everyday play.